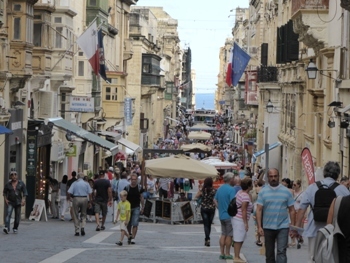 We visited the charming city of Valletta, Malta on a perfect weather day. Market Street was full of shoppers. 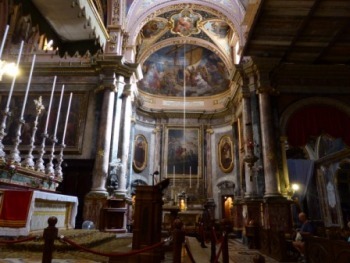 The small Church of St. Paul's Shipwreck was filled with paintings and other art work commemorating Paul's mission work on the island while he was a prisoner. 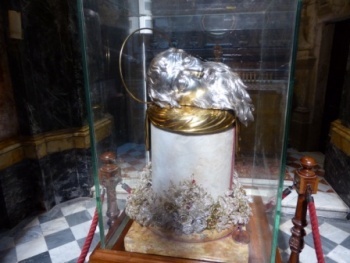 This is part of the pillar from Rome upon which St. Paul was beheaded. The nearby altar displays his right wristbone, which is carried through the streets as part of a feast day processional. 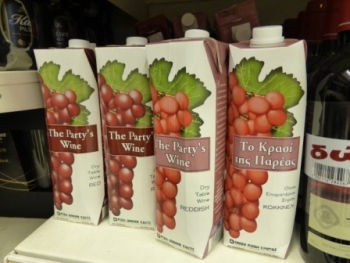 While perusing the wine section in a grocery store in Athens, Greece; we came across a dry table wine that was new to us - Reddish! 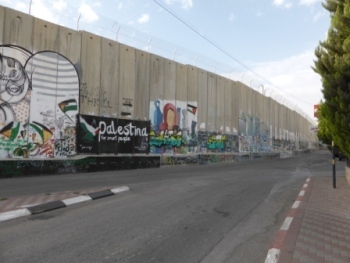 Entering Bethlehem, Palestine from Israel was a little scary. The walls at the border crossing were filled with graffiti and topped with razor wire - not unlike the US/Mexican border - but with a lot more guns. 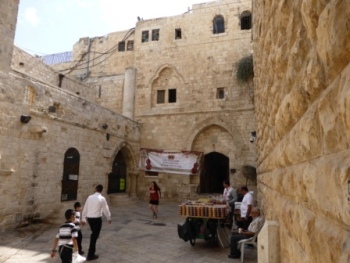 We were surprised that Bethlehem is less than 5 miles from Jerusalem and Herod's Palace. 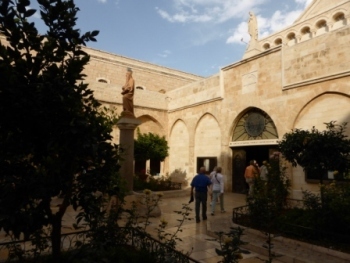 Thousands of people pack the main square to visit the Church of the Nativity each Christmas Eve. We visited the grotto under the sanctuary that is believed to be the stable-cave in which Christ was born. 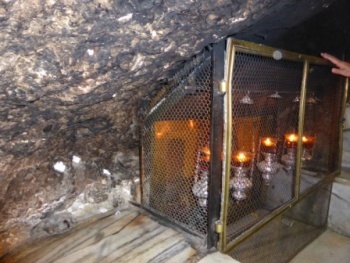 Lanterns burned in the small manger area. 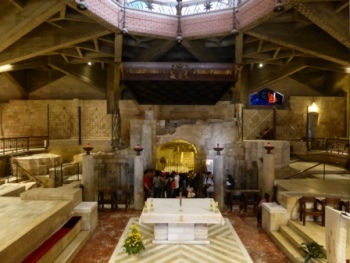 Back in Israel, we drove north to Nazereth and the Church of the Annunciation. The Virgin Mary's house has been excavated and is at the base of the church. 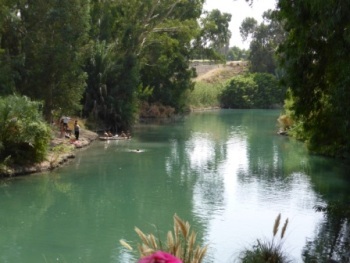 Not far away is the Jordan River, which is still a place for baptisms; but also for recreation. The east bank is Jordan and the west bank is Israel. We saw several groups of people dressed in white robes being submerged and baptized. The crystal clear river was pleasantly cool on our sunny October day, with highs in the 80s. 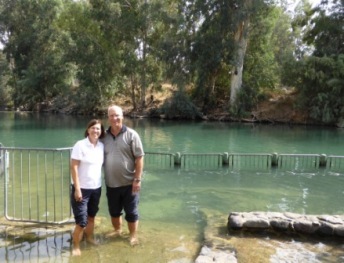 Farther north is the Sea of Galilee which flows south into the Jordan River and the Dead Sea. 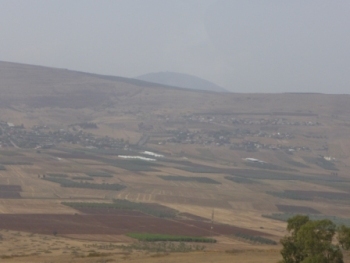 The Golan Heights are in the background. 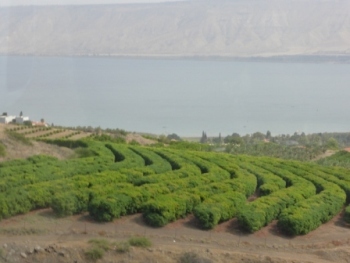 The Sea of Galilee provides irrigation for the many vineyards and orchards along the shore. Avocados, pomegranites, date palms and olive trees were plentiful. 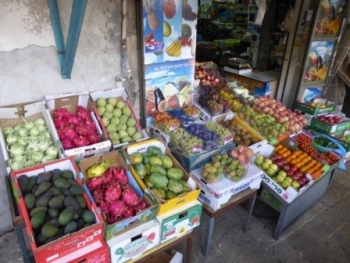 In the markets, we saw exotic fruits and vegetables like Dragon fruit, prickly pear and kohlrabi. 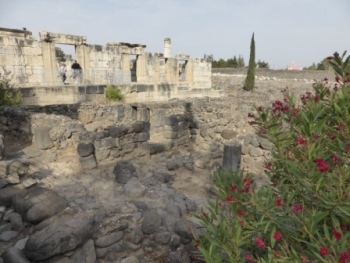 The city of Capernaum, where Peter's house was located, is on the Sea of Galilee. Jesus taught in that synagogue. The ruins of the ancient city are being excavated. 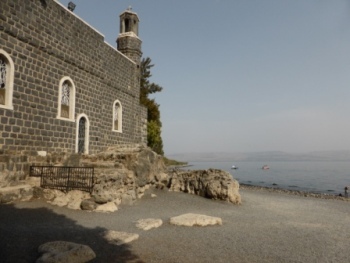 Also along the Sea of Galilee is Tabgha, where Jesus performed the miracle of loaves and fish and appeared to Simon Peter after the crucificxion. A chapel is located near that place to commemorate the event. 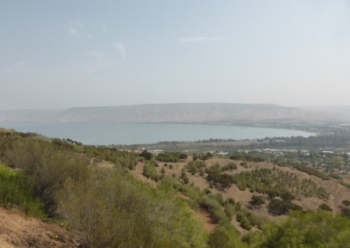 Only slightly inland, the Mount of Beatitudes is where Jesus preached the Sermon on the Mount. The entire hillside overlooks the Sea of Galilee. 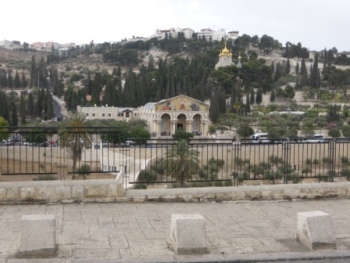 The Mount of Olives is still covered with many olive trees; but it also is the home for many Israelis and the Basilica of Gethsemane. 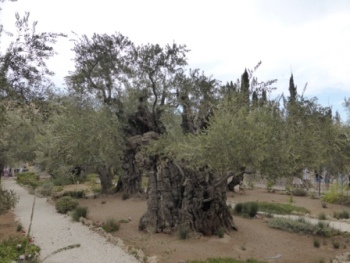 Some olive trees on the Mount of Olives are said to be 2,000 years old. 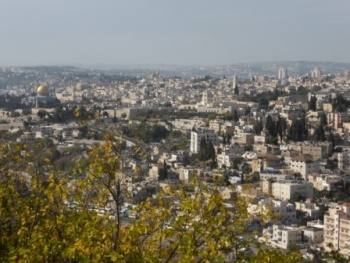 From the Mount of Olives, you can see past the Valley of Kidron to Jerusalem and its many "quarters". The golden Dome of the Rock on the left is in the Muslim Quarter. Slightly right of center is the pinnacle of the Lutheran Church of the Redeemer. 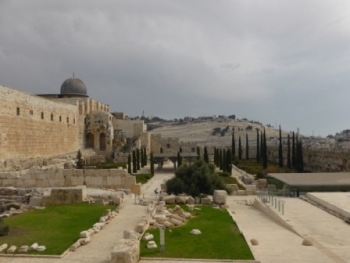 The Dome of the Rock now covers the area that was the Temple of Jerusalem in the time of Christ. Outside, the walls are built with Jerusalem limestone which looks golden in the sunlight - "Jerusalem the Golden". We entered through the Zion Gate, into the Jewish Quarter. 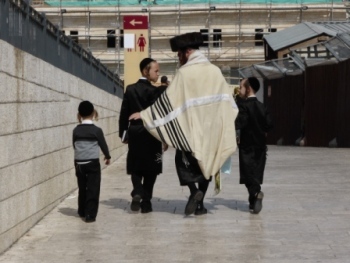 Since we were there for the festival of Tabernacles, many Hassidic (ultra Orthodox) Jews were there from all over the world. 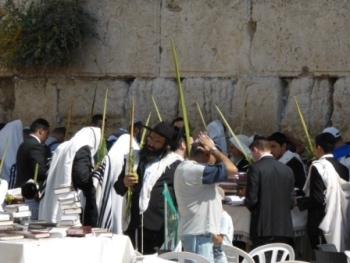 At the Western Wall (the Wailing Wall), men and women carried palm branches wrapped in myrtle and willow leaves following instructions given in Leviticus 23:40, wrote prayers on small pieces of rolled paper and left them in cracks on the wall. 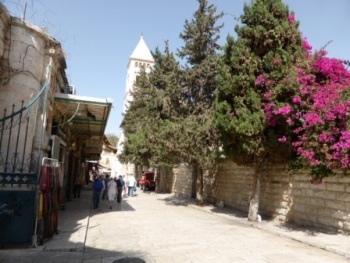 In the Christian Quarter the Lutheran Church of the Redeemer and Martin Luther School shared the same block of land. Close by the "Upper Room" was near where Jesus and the disciples celebrated the Last Supper. 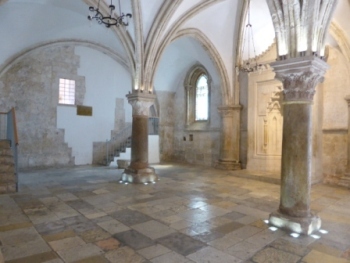 This room from the time of the Crusaders is thought to be built over the room of the Last Supper. 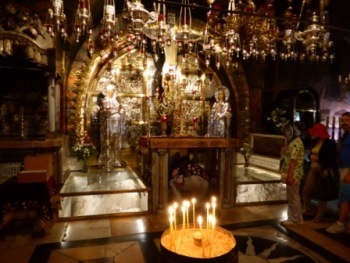 Also in the Christian Quarter is the Church of the Holy Sepulcher, built on Golgatha. Long lines of people wait to kneel and kiss the spot where the cross was planted. 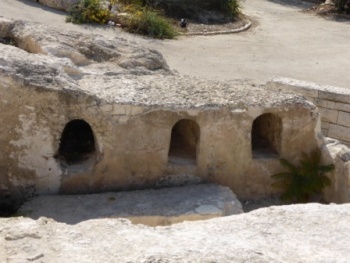 These tombs, just outside of Jerusalem, date from the time of Christ. Mount Tabor is where the Transfiguration of Christ took place as He rose into heaven. 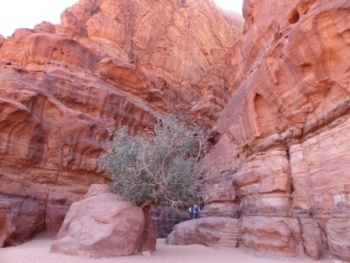 Wadi Rum, Jordan is the site for many of the scenes from the film "Lawrence of Arabia". 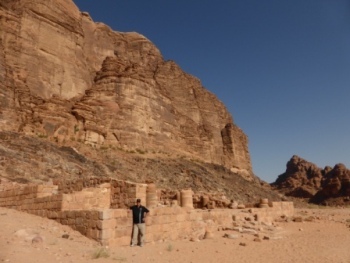 Paul is standing near the ruins of a Nabataean temple dating from 4,500BC. Near the temple our Bedouin hosts treated us to tea in their tent and taught Vicki how to tie her turban. 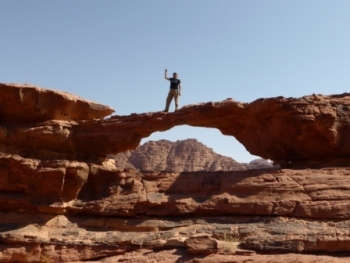 We traveled in a 4x4 to the Khazali Canyon. Notice the people at the bottom going into the narrow entrance. 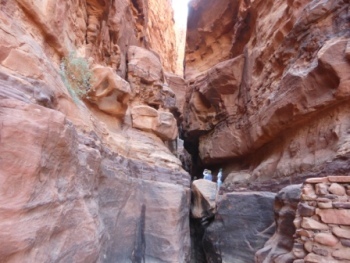 We had to step on 6" ledges to work our way into the canyon. Petroglyphs (writings carved in the stone) on the walls were well preserved, since there is little rain or wind in the canyon. 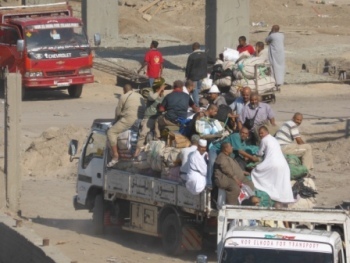 They showed ostriches and other animals no longer living here. We did some rock climbing to enjoy the view from the Small Arch. 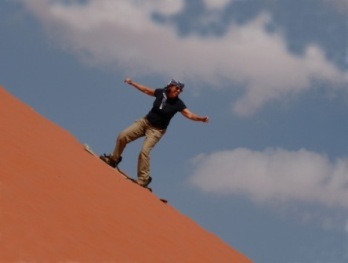 . . and later had some fun "surfing" the Red Sand Dunes. 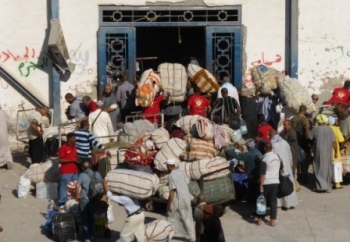 In Safaga, Egypt at the luxurious cruise terminal more passengers with designer luggage joined the ship. And these Holland America tour busses were packed to go see the sites. 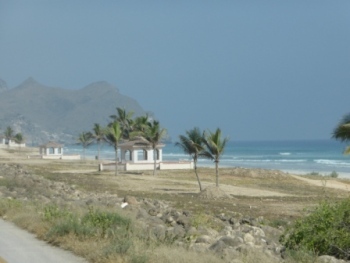 In Salalah, Oman we drove out to Mughsail Beach; which was deserted in the middle of the warm day. 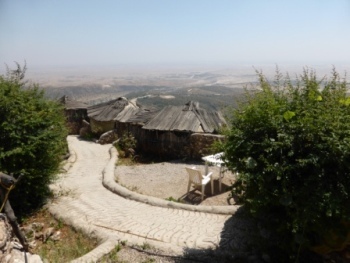 Up in the Qara mountains, we visited Job's tomb. 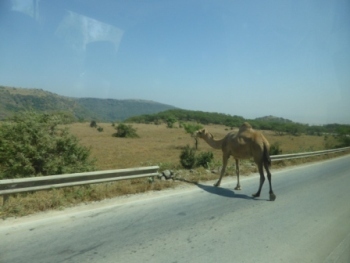 Along the way, we often saw camels wandering across the road. One of the restaurants had a beautiful view of the city of Salalah and the Arabian Sea. It's a popular place in the evening, since each table of people has their own hut lining the cliff and can look at the city lights below.